Data on exopolysaccharides synthesis by psychrophilic fungi and bacteriae, halo- and thermophilic archaea and bacteriae, including those isolated from deep-sea hydrothermal vents — sources — were provided. Physiologic significance, physico-chemical properties and possible practical applications of exopolysaccharides from unusual sources were analyzed. Most of them have immunomodulating, antiviral, anticoagulant, antitumor, antioxidant activities promising for medical and pharmaceutical applications. 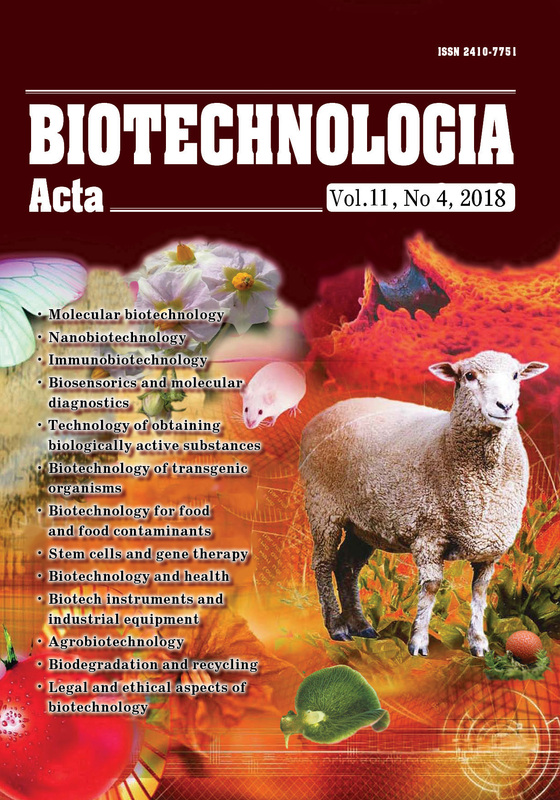 Meanwhile, based on the literature date, the conclusion follows about the urgent necessity to develop efficient technologies for synthesis of these exopolysaccharides by nontraditional producers, which currently lags far behind common techniques. Key words: exopolysaccharides, thermophiles, psychrophiles, halophiles, hydrothermal vents. 2. Grinberg T. A., Pirog T. P., Malashenko Yu. R., Pinchuk G. Microbial synthesis of exopolysaccharides on C1–C2–compounds. Kyiv: Naukova dumka. 1992, 212 p. (In Russian). 3. Pidgorsky V. S., Iutinska G. O., Pirog T. P. Intensification of microbial synthesis technologies. Kyiv: Naukova dumka. 2010, 327 p. (In Ukrainian). 11. Guezennec J. Bacterial exopolysaccharides from unusual environments and their applications. The perfect slime: microbial extracellular polymeric substances (EPS). Flemming H. C., Neu T. R., Wingender J. (Ed.). IWA publishing. 2016, 135–152. 16. Kane kar P. P., Deshmukh S. V., Kanekar S. P., Dhakephalkar P. K., Ranjekar P. K. Exopolysaccharides of halophilic microorganisms: an overview. Industrial biotechnology: sustainable production and bioresource utilization. Thangadurai D., Sangeetha J. (Ed.). Apple Academic Press. 2016, 1–27. 20. Brock T. D. Life at high temperatures. Evolutionary, ecological, and biochemical significance of organisms living in hot springs is discussed. Science. 1967, 158 (3804), 1012–1019. 28. Rinker K. D., Kelly R. M. Growth physiology of the hyperthermophilic archaeon Thermococcus litoralis: development of a sulfurfree defined medium, characterization of an exopolysaccharide, and evidence of biofilm formation. Appl. Environ. Microbiol. 1996, 62 (12), 4478–4485. 35. Manca M. C., Lama L., Improta R., Esposito E., Gambacorta A., Nicolaus B. Chemical composition of two exopolysaccharides from Bacillus thermoantarcticus. Appl. Environ. Microbiol. 1996, 62 (9), 3265–3269. 48. Vincent P., Pignet P., Talmont F., Bozzi L., Fournet B., Guezennec J., Jeanthon C., Prieur D. Production and characterization of an exopolysaccharide excreted by a deep-sea hydrothermal vent bacterium isolated from the polychaete annelid Alvinella pompejana. Appl. Environ. Microbiol. 1994, 60 (11), 4134–4141. 51. Thibodeau A., Takeoka A. The applications and functions of new exopolysaccharide “Deepsane” from the deepest oceans. Fragr. J. 2006, 34 (3), 61–68. 53. Helm R. F., Huang Z., Edwards D., Leeson H., Peery W., Potts M. Structural characterization of the released polysaccharide of desiccation-tolerant Nostoc commune DRH-1. J. Bacteriol. 2000, 182 (4), 974–982. 59. Guezenneca J., Pigneta P., Lijou rb Y., Gentricb E., Ratiskolc J., Colliec-Jouaultc S. Sulfation and depolymerization of a bacterial exopolysaccharide of hydrothermal origin. Carbohydr. Polym. 1998, 37 (1), 19–24. 66. Deming J. W., Young J. N. The role of exopolysaccharides in microbial adaptation to cold habitats. Psychrophiles: from biodiversity to biotechnology. Margesin R., Schinner F., Marx J. C., Gerday C. (Ed.). Springer, Cham. 2017, 259–284. 96. Antón J., Meseguer I., Rodríguez-Valera F. Production of an extracellular polysaccharide by Haloferax mediterranei. Appl. Environ. Microbiol. 1988, 54 (10), 2381–2386. 100. Severina L. O., U senko I. A., Plakunov V. K. Exopolysaccharide biosynthesis by the extremly halophilic archebacterium Halobacterium volcanii. Mikrobiologiya. 1990, 59 (3), 437–442. 124. Pirog T. P., Ivakhniuk N. A., Voronenko A. A. Microbial synthesis of exopolysaccharide ethapolan on various types of waste vegetable oils. Vestsi Natsyyanal’nai akademii navuk Belarusi. Seryya biyalagichnych navuk [Proceedings of the National Academy of Sciences of Belarus, biological series]. 2017, 2, 87–93. (In Russian). 2015-07-22 - THE HALOPHILICITY OF FILAMENTOUS FUNGI ISOLATED FROM SALINE SOILS OF SOUTH CAUCASUS Kvesitadze E.
THE HALOPHILICITY OF FILAMENTOUS FUNGI ISOLATED FROM SALINE SOILS OF SOUTH CAUCASUS Kvesitadze E.